When it rains, it pours!! Yeah, this month sees a battalion of new launches and food festivals in Chennai. What started off with the Cuisines from the Nawabs has taken a detour to Goa, with new menu launches at On the rocks and the Citibank Restaurant Week's 2nd edition in Chennai, this month is a bang!!!! 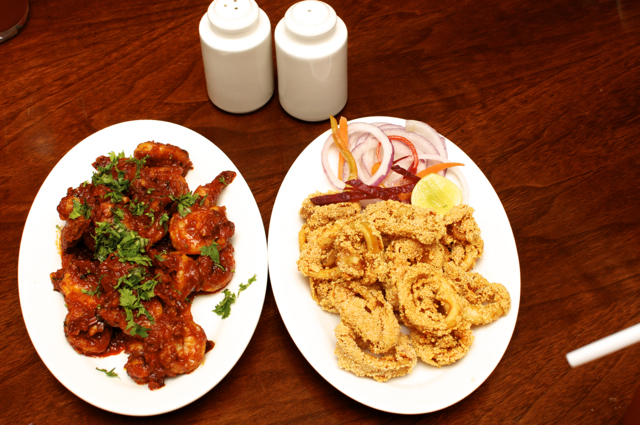 So, when we say Goan food, we think of beaches, grilled fish, chips, mayo dips and booz! Right? Wrong, apparently. A few years back, a very nice Goan food fest at Residency gave me insights into Goan cuisine which was helmed by a home chef, but this time at Hyatt Regency's Spice Haat, they flew down their exec chef from their Goa Hyatt!!! So what's wrong with grilled fish, chips, mayo dips and booz? Everything! "Those are the fancy beach foods that were born out of necessity due to lots of foreign tourists," he says. The real Goan cuisine is far from that. So, peri peri chicken has the peri peri chilly? Peri Peri unlikely! :-) "The names have stuck from the olden times, but we now rarely use the peri peri chilly itself, but a blend of spices to give a similar feel," feels the chef. The actual peri peri chilly is way too spicy, apparently! While it is available as part of the buffet, me being a buffet-hater, preferred the thali. Though available only for dinner, the stuff that comes in the thali (except the dessert which you have to move your backside and walk to the buffet) has everything in the buffet that is part of this festival. Oh, except starters also, but that is served on your table. And we had the peri peri chicken and a crispy fried squid to start off. Now that I know there was no peri peri chilly, my brains were confused, but not enough to stop me and the friends from gulping down a few prawns and squid. For the main course, I liked only two dishes, the Goan Chicken Green Curry, which I thought will taste similar to the Thai green curry, but they are like, poles apart. Extremely flavourful but completely different from the Thai Green curry. I also liked the mushroom Xacuti, which is a spice blend of 12 different spices. Again, names stuck, but our chef here didn't mention much about the how the names originated. While the main courses were a combination of hits and misses for me, the desserts were excellent. 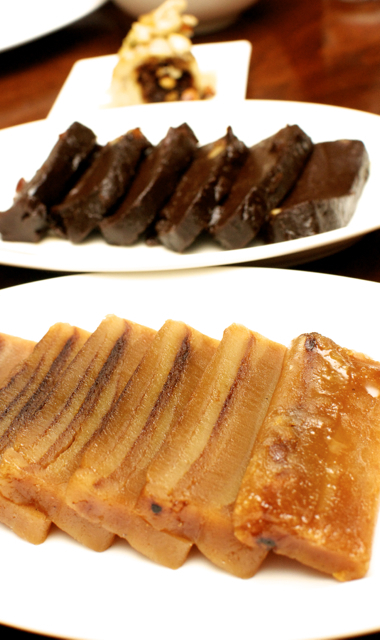 While we also had the only dessert that we (or at least I) know of, the Bebinca, which was excellent by the way, we also had what they call the Dodol and another one called Alle Belle. Now, this Dodol is exactly what my family makes calling it, 'Karupatti Halwa' or Black Jaggery Halwa! It was great to be able to get that taste after so long and I wonder how it made its way from Nagercoil to Goa (or vice versa). 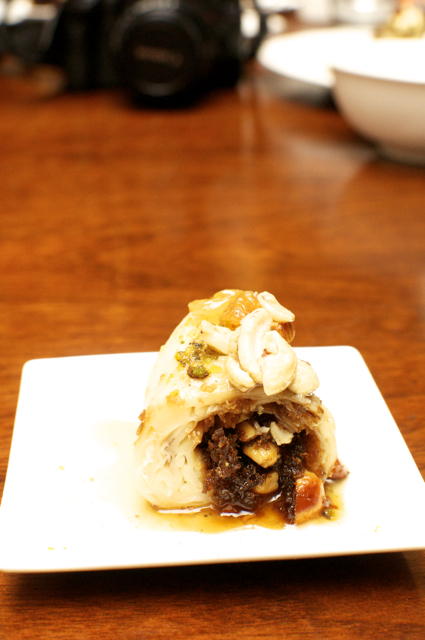 The Alle Belle was like a modern Goan dessert, with a stuffed pancake, rather crepe stuffed with coconut and nuts! 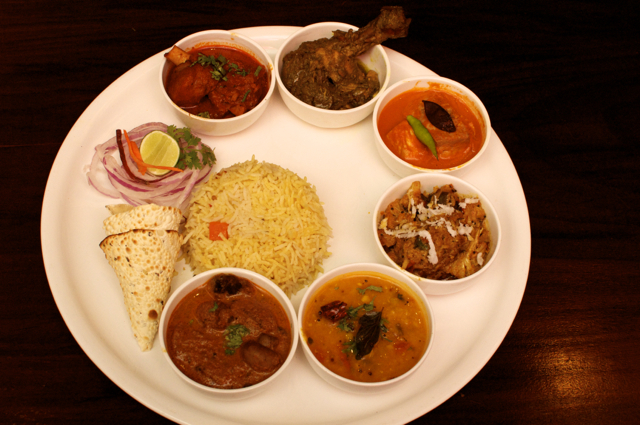 Since it is part of the buffet, its the same price as the buffet, but you can get the thali for about 200 bucks lesser. Look for more from the Restaurant Week when the post goes up on Monday!! !